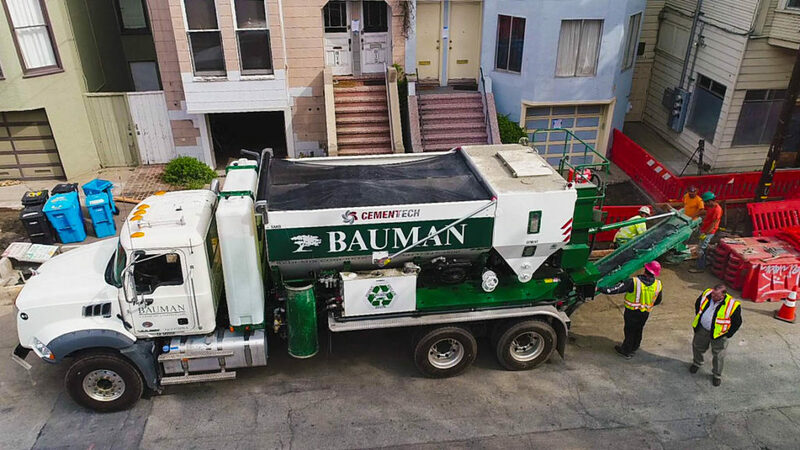 Bauman Landscape & Construction, Inc.
Business, leisure, or living, millions of people spend time in the city by the bay every year. 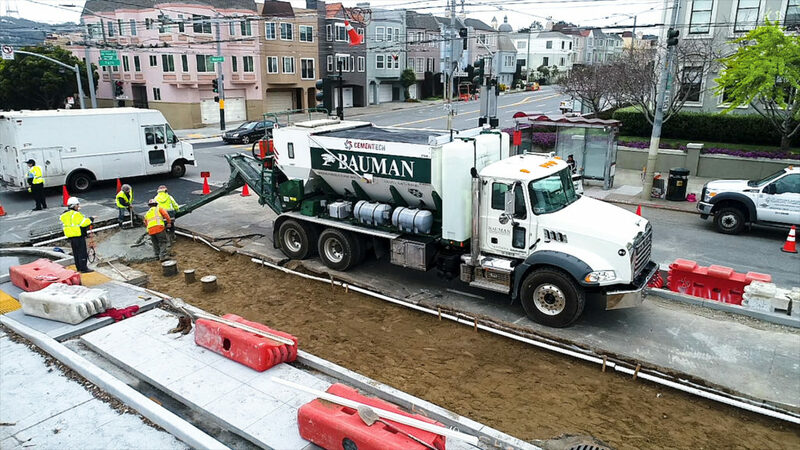 Since 1978 Bauman Landscape & Construction, Inc., a general contractor specializing in public works, has built a long-standing relationship with the City of San Francisco during that time. Owner and president Mike Bauman, along with daughter Angela who helps run the company, spent a few minutes discussing the company and how their growing fleet of C60 Series mobile mixers has continued to cement their standing as a leader in concrete production. 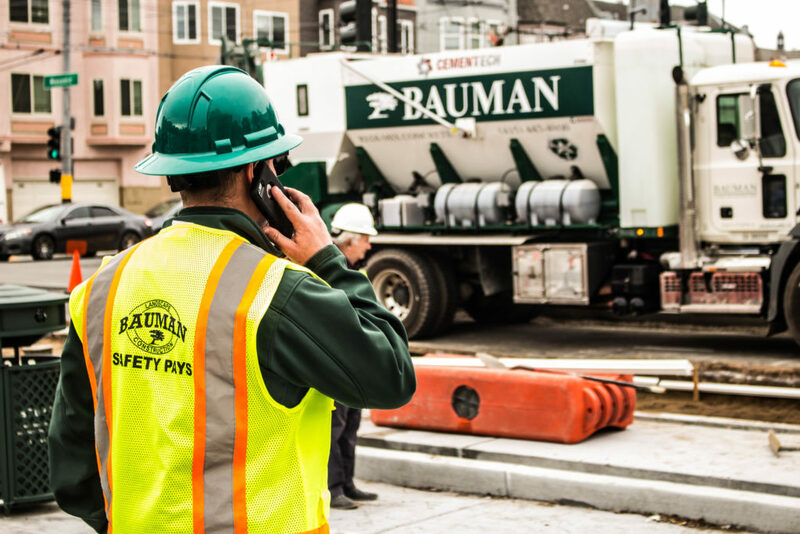 Tell us a little bit about the history of Bauman Landscape & Construction, Inc.
We have been in business since 1978. We’re a general contractor. We do site work, mostly public works, parks, and streetscapes. 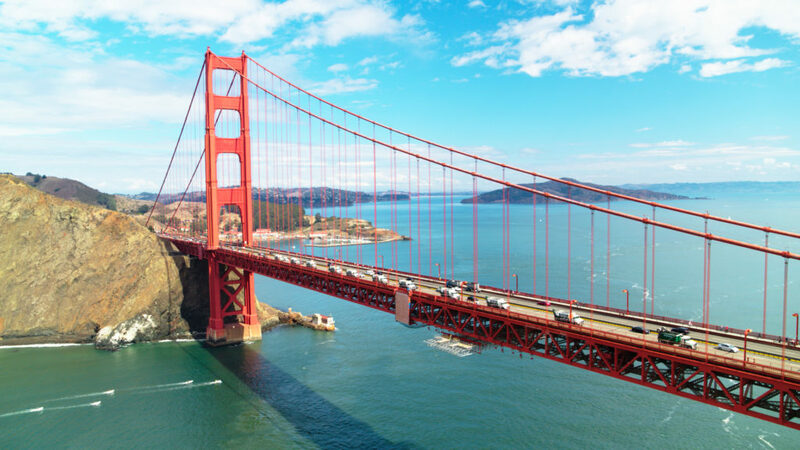 Ninety percent of our work is for the city of San Francisco and then we also sell ready mix with the volumetric mixers to down site customers. How long have you used volumetric concrete mixers and why did you make the change? We started using volumetric mixers about six years ago because we couldn’t get concrete on time. 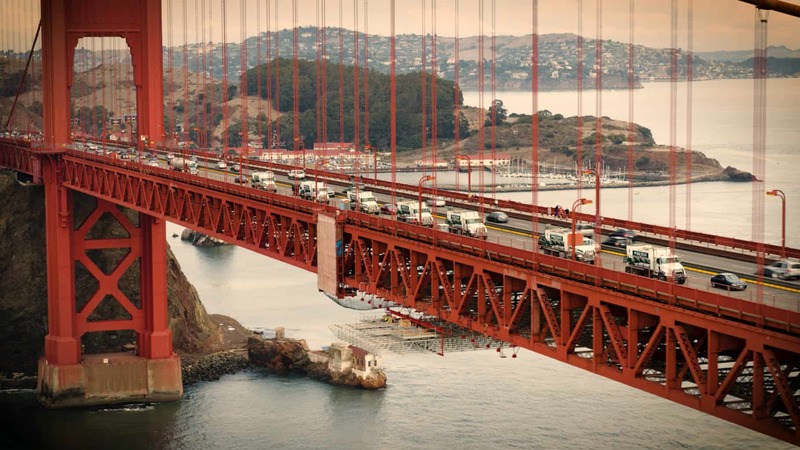 There was long lead time getting concrete and the prices of the ready mix was going up like crazy. I think we were the first ones to have a volumetric mixer in the city. We used a different brand. They were difficult to use. You had to have a pretty skilled operator to use them. They [a Cemen Tech unit] pretty much took care of all the problems we were having. 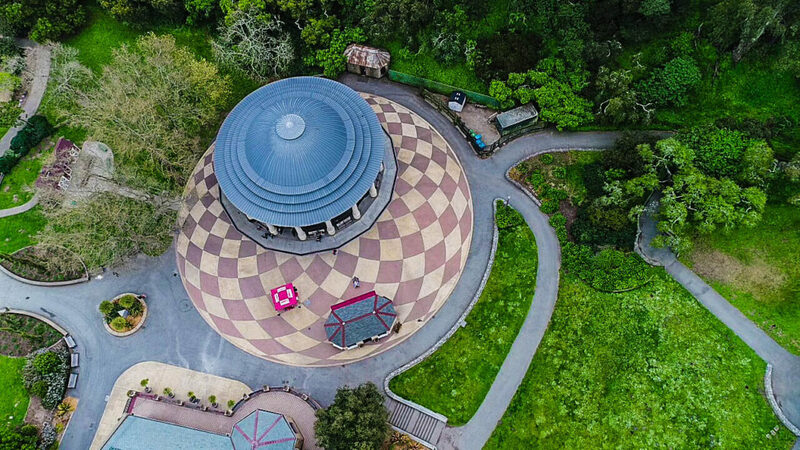 Talk about your relationship with the City of San Francisco and beginning to transition from barrel mixers to volumetric mixers. It took a while to get the city to allow us to use them. It was hard to get them to open their eyes to volumetric mixers. So that was kind of our hesitation right at the beginning when we were at World of Concrete. You know is the city going to buy off on this and then we kind of took a leap of faith and they did. Then our first project I think we used 2,000 yards or 3,000 yards of concrete all with volumetric mixers right on site. We only had two mixers at the time and we staged a staging area right on site with a silo and aggregates and we poured the whole job with it. We had to take tests and we poured and they were taking tests on every single load out of the mixer. The results were phenomenal, so they finally realized that this was a good thing. So, they are pretty happy with them right now. They are so used to barrel mixers. Since we were the first ones out here, we have a great reputation with them. They like our mixers, they like the mix better than the barrel mixers. The city loves it. Especially, because we take all the concrete. We take it back to the yard. We crush it up and we re-use it as the concrete aggregate. So, we are pretty green as far as recycling and reusing the concrete. It is huge in the city. They require everything to be recycled. You mentioned the city was quite satisfied with the results from the first job. After we finished that first job, we did a streetscape down on Chestnut Street and our whole baseline was based on using our mixers. So, the sequencing was quick. The city was blown away. They said, “We don’t think you can do it that quick.” We were beating the schedule by almost a year. And sure enough we did and it was awesome. How do you recycle when producing concrete and meet the city’s requirement? We are the first one to use 100 percent recycled aggregate in our mix. The barrel mix guys use about 50 percent. And we also use a blended sand so when you crush the aggregate. We blend about 50 percent of the concrete dust with virgin sand. So, we are using 75 percent of our concrete is recycled. You have to send in when you do a job for the city you have to send in a monthly report about how much you recycled. What you have done with all the waste materials and how you used it. So, it is a big part of the contract. If you don’t send that in you don’t get paid. 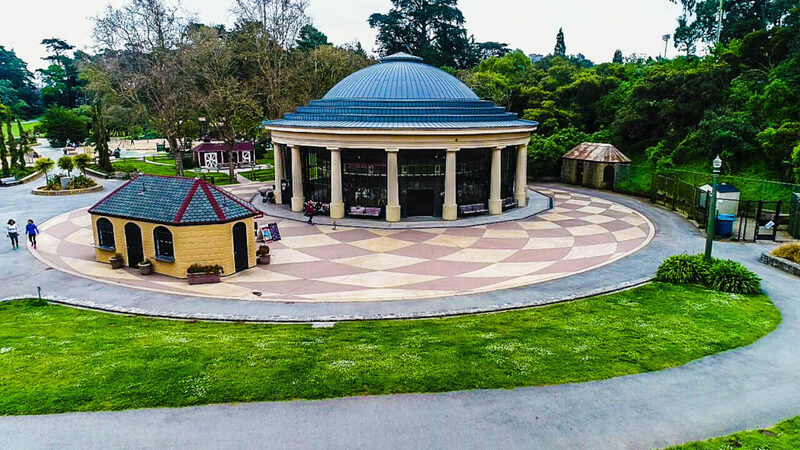 Has having a green approach to concrete helped expand your customer base beyond the City of San Francisco? When you start working with the bigger contractors, the generals who are fighting for the LEED credits on jobs its make you more appetizing to them. They want to use someone who is going to help them meet the credits and even if they have met them in different ways if you could help them look better to their client it is always great. [With] The general contractors, we fill out the LEED credit reports and they turn it into whoever is funding their project and we help them meet it quite a bit. I think since the city embraced it, we have seen other people being interested in getting involved in it. We have a lot of people who see us using our mixers and call us and we end up selling to a lot of the competition because right now we always have availability. We have developed some good relationships with some of the other people that we have worked within the city. 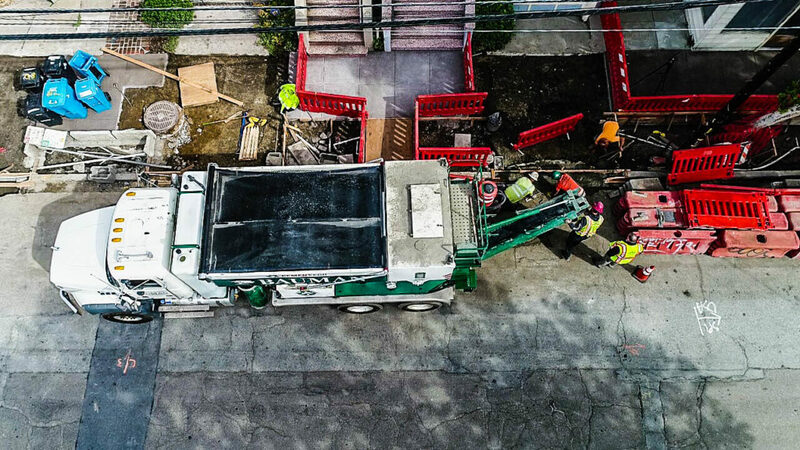 We’re able to help them out and deliver concrete on time and they don’t have to worried about the truck from the time to the plant to the yard to put the mix in the ground. Ours, we can stop while they catch up and start pouring again. So, it is an ease for the end user to as far as volumetric mixers and they only pay for what we use. We started getting into shotcrete and Gunite and slurry mixes and they have become really popular around here because they don’t have to wait three weeks for a slurry mixture from the ready-mix plant. Talk about the training curve with a mobile concrete mixer and production compared to any previous production method. Before we couldn’t get any drivers because we couldn’t get anyone skilled enough to run them now, we can get drivers. Which is great. That was really one of the main benefits of it. It is incredible because we could take a UPS driver and put them in a C60 and he could run it. We are getting a lot of drivers that were driving other trades or driving mail across country and they are interested in running the C60. Jim [Bishop] came out here and worked with all our guys, worked with our mechanics, worked with our drivers. He has trained a couple of our guys who are really, really good at the mixers now. They can train some of our other drivers now which is great. He was able to get these guys, so they are 100 percent qualified to run the mixers and now they can pass on their expertise to new drivers. What’s your favorite part of using a Cemen Tech unit? The automatic mix designs. We can pre-load all our mix designs. We probably have 25 mix designs in them because of all the different type of work that we do out here. That is one of the main reasons we love it. Because, they can just punch in the mix designs and the gates do everything else. There is no confusion about what the gate setting is or anything else. It simplifies it and makes us a lot less nervous sending someone out there running the mixer. Talk about how having all design mixes at your fingertips helps with the many different city projects you do. We do a lot of streetscapes. So, the ramps and the curb and gutter and the sidewalks are all different mixes. One of the huge benefits for us is in the city, even pouring the street ramps on the corner you have three different mixes. Curb is a different mix than the actual ramp itself and it’s a different mix in the sidewalk. We used to have to get three short loads just to pour a curb ramp. So right here with the mixers, we can just change the mix three different times in one truck and pour the entire thing. Which has been absolutely awesome for us because we do streetscapes everywhere and that has just been an incredible advantage. It saves a whole bunch of time and a whole bunch of money. Just in general with the short loads themselves and then having guys standing around waiting for the next mix and it’s just been great. Are there other features that make your job easier? The C60s we have with the liquid color which is great because everything we do out here is color. Even the simple sidewalks have color in them. The color system is great. Add mixture systems is great! We use a lot of ad mixtures accelerators for the street base. You mentioned reliability issues with a previous brand — what has your experience been so far with Cemen Tech? The parts service is amazing. It’s like 24 hours. It is incredible the parts. We have never had a problem with parts. The nice thing about these mixers is we don’t have a lot of down time. With the other brand we were constantly repairing them. You know some things wear out, but these things are pretty dependable. We were always worried that if we had a mixer go down what were we going to do but these mixers, the things that go down every once and in a while it’s the trucks, not the mixers. Cemen Tech has done a great job with that. It is fantastic. Are Cemen Tech’s volumetric mixers versatile enough to meet the various needs and situations that can arise during a job? It is an amazing machine. It can do almost anything if you want it to. Just have to figure it out. We have a 32-meter pump, so we also use the volumetric mixer to put into the pump, so we can put building concrete and all sorts of other things with it. We can get into tight access spots with the volumetric mixer with our pump. It is really, really, compatible with concrete pumps and the mix come out really well. How do you make sure every single pour is consistent and high-quality? We have our own quality control person on staff, so we run our own test in house. Trial batches, aggregate testing. We make sure everything is up to par so that when we submit our product and pour our product, we know that there is nothing that can be questioned if we are testing it ourselves.